I have been back almost a month and getting adjusted. I do apologize for the lack of communication but I do not have internet access at my house. I have to drive into town to a hotel and use the internet and hope the internet is working when I get there. Several times I have arrived at the hotel to find it not working and have to return home and try another time. We are in the middle of have a week of mobile clinic in Peredo with a team of 30 Americans. God blessed us with 4 nurses on this team and we are working with 2 Haitian doctors. We are seeing around 220 patients a day and giving them all the medicines they need out of our pharmacy. We had a mobile clinic with another short term team at the beginning of the month and saw an estimate of 900 patients in a week. This team will surpass even that number! Please pray for this team’s safe return home on Saturday and thank God that they worked so well together to make a successful week in the clinic. I am launching a new program in the village of Peredo starting next week. It has long been my prayer that I could speak Creole well enough to teach others about nutrition, medical care and child care. I am finally there! This week I have been talking with mothers in the clinic who bring in newborns to 3 month olds who are not at the weight they should be. I am taking down their basic information and then will visit each of the homes next week. Five babies will be chosen to start the program and I will closely monitor their weights while having a class for their mothers weekly and train them in good nutrition, child hygiene care and help them to be a support person to each other. Please pray for wisdom in choosing the babies that will need and benefit from the program the most and for the cooperation of their mothers. There are so many Pediatric studies which show the importance and benefits of good nutrition during the 1st three years of life. This will also be a ministry tool to show how Christians care about the community also. These families will be encouraged to come to our church services and be encouraged by the Haitian Christians already worshipping there. There is a great need I am asking for help with. I do not have internet service at the mission house. To start the satellite internet service in the area of Haiti I live in is $2100 US. It comes with all the equipment and installation. Then the monthly service fee is $80 a month. I am not asking for the internet for entertainment but to keep my line of communication open with you all and to be able to better communicate with the stateside of the mission There are also nutritional programs set up in other places in Haiti and Africa like the one I am starting in Peredo. Their information can be found on the internet and there are sites that allow missionaries and humanitarian organizations to compare data and help each other who are in similar situations. Would you or your church consider helping me start the internet here in the mission house in Jacmel? If so please send your support the same and earmark it for Ginny Andrews-internet. 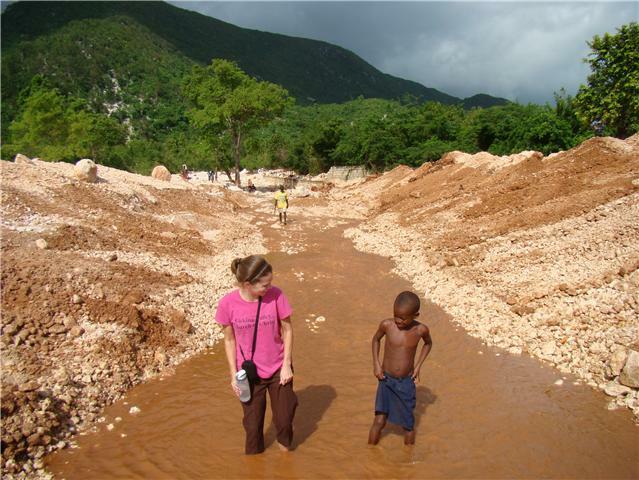 Or you can always go to www.haitianchristian.org to donate and in the comment box please type-Ginny Andrews-internet. I am working with an intern from Lincoln Christian University for the next month in Haiti. She will be staying at the guest house with me and we will work together and with teams when they come in. She’s been here about 5 days and a little homesick so please pray for her strength and that we will follow God’s direction for us for her stay in Haiti. Please feel free to email me with any questions. Stories and pictures can be found at www.ginnyinhaiti.blogspot.com. Please be patient as this is not updated frequently b/c I do not have regular internet connection.